Zero Energy Logic is thermodynamically permissible and at least two independent ways of accomplishing it have been devised. One group has built such a device and other groups are working on constructing the other version. Showing that it works is trivial, yet it has aroused complaints ranging from error to fraud from some excellent scientists. Like anyone else, scientists become confused easily if the topic is one which seems to contradict what everyone already knows. In the field of zero-energy logic, four misunderstandings have served as potent barriers to acceptance of what seems obvious to others. Barrier 1 is what we call the Something-from-Nothing Argument. No scientist accepts that logic gates might create the right answers by magic. Yet that is what zero energy logic seems to do. How can it be possible to get something for nothing? Barrier 2 concerns nonlinearity. The argument is simple. Logic involves making choices. It is nonlinear. Every nonlinear element requires energy, so the idea of performing logic without requiring energy is obviously absurd. Barrier 3. In one of the strangest papers in the field, Richard Feynman published a devastating attack on electronic zero energy devices. That is not surprising except that he chose to publish it in an optics journal, and the paper did not address optical logic. Sadly, we will never know why. We like to think that he may have known intuitively what our work later proved: The only way zero energy logic can work is to build it entirely of passive devices – waveguides, mirrors, beamsplitters, and the like. Those do not require energy to operate. Feynman, like many others after him, did not see how to do logic using only passive components. His malediction of the concept of practical electronic logic creates a space of other technologies – a space only recently filled by optics. Barrier 4 is unique to optical logic. 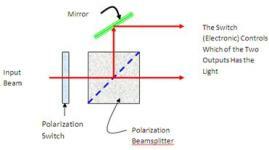 Even in the best cases, some of the light passing through the optical logic device will be absorbed, scattered, or otherwise lost in the process, so Zero Energy Optical Logic is absurd. That barrier confuses many people. The greatest argument for zero energy optical logic is that it works and is easy to understand. The barriers to understanding it must drop away in that case. And we show here why each barrier is correct in some respect but not applicable to our Zero Energy Optical Logic.